love the simple and basic traits and for guests who wish to organise their stay more varied with excursions, relaxation, fitness and massages. The countryside of Modica, which is about 5 km away, welcomes the new elegant Pietre Nere Resort, located on the slopes of the Ibleo plateau. The famous prehistoric settlements of Cava d'Ispica are just minutes away from the Resort while the charming towns of Noto, Scicli and Ragusa Ibla, inserted in the World Heritage by UNESCO, are just a few kilometers away. The nearest airport is Catania, approx. 115 km. The modern design style, features all areas of the Pietre Nere Resort. The sophistication of the furnishings and the elegance of the rooms are a constant in the hotel, furnished with strong contrasts between black and very dark shades. The rooms are spacious and bright; large windows illuminate the ground floor and overlook the winter garden, where guests can enjoy moments of absolute stillness. Refined and elegant, with design furnishings, the 30 rooms are divided on two floors, while the 2 suites are located in an external building , the result of the restoration of an ancient country. All rooms, hell and bright, have bathroom with shower, complimentary Wi-Fi connection are characterized by the use of white as a symbol of purity and elegance. Classic – Double or twin room with view of the countryside or swimming pool. Superior – Double or twin with small terrace and view of the countryside or the swimming pool. Deluxe – Double room with view over the countryside. Suite – Two rooms in the annexe, located in the courtyard of the resort. Separate entrance 10 meters from the hotel lobby. Living room, double room, bathroom with shower, hallway for luggage and porch. Max 4 adults and 1 infant. The wellness centre offers Turkish bath, sauna, Scottish shower, emotional shower, hot tub and relaxation area with tea corner. It is open from Monday to Saturday from 15:00 to 21:00, on Sundays and public holidays from 10:00 to 21:00, with last access at 19:00. Moreover it offers a fitness area with Technogym equipment (open every day from 9:00 to 21:00); rooms for massages and treatments and Spa-Suite with Jacuzzi cabin (sauna, Turkish bath, emotional shower), Jacuzzi, loungers, private access to the massage room and reserved services. All wellness services are on request and payable on-site. The Pietre Nere Resort has provided, for guests who want to stay fit, the construction of a multipurpose sports pitch and tennis, surrounded by the colourful Mediterranean vegetation. The restaurant's name "Spirito Mediterraneo" anticipates the delicacies served to guests of the Pietre Nere Resort: delicacies coming from the rich culinary traditions of Sicily, revisited with a modern touch to satisfy the most discerning palates. Basic importance is given to the choice of raw materials and the use of seasonal products. The time of the dessert represents the summit of taste, thanks to the discovery of the delicious chocolate of Modica. A bar service is available at any time of day. The nice and big swimming pool (150 sq.m.) with sun terrace has a comfortable Jacuzzi incorporated, where guests can take care of themselves and can relax their body and mind. As alternative to the pool is the roof garden with awesome overview on the Sicilian countryside. Those who prefer to spend some time with a good book, can choose a comfortable sofa in the reading room. A professional concierge service is available for any information and needs, to make the holiday unforgettable. Tourist tax – The municipality of Modica requires the payment of € 2,00 per person/overnight for a maximum of 7 overnights and has to be paid on spot. Children up to 17 years and adults over 65 are exempted. 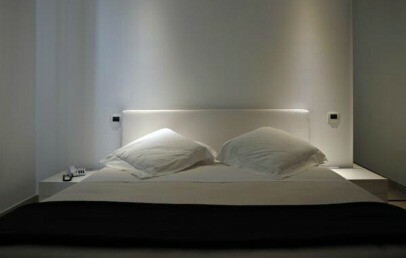 Double room, elegantly decorated in white, modern style. Private bathroom with shower, free Wi-Fi. It can accommodate maximum 2 persons. 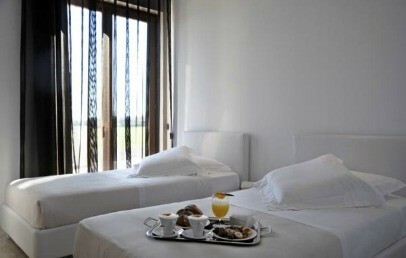 Double room, elegantly decorated in white, modern style. Small terrace, private bathroom with shower, free Wi-Fi. It can accommodate maximum 2 persons. Two rooms in the annex located in the courtyard of the resort, with independent access at 10 meters from the hotel, elegantly decorated in white, modern style. They have a living room, hallway for luggage and porch. Private bathroom with shower, free Wi-Fi. They can accommodate up to a maximum of 4 adults + 1 infant in cot. 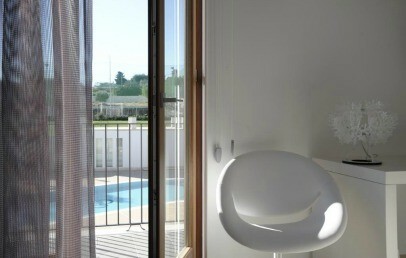 Double room, elegantly decorated in white, modern style. Private bathroom with shower, free Wi-Fi. They can accommodate up to a maximum of 3 adults or 2 adults + 1 infant in cot.